Okay, so for hour 5, we’ll talk about what to eat, what not to eat, and what I eat. And for this section, basically we’re gonna go through your handout, the dos and the don’ts, after a little introduction here. This part is in your handout somewhere, I don’t know the order. But it says, this is not exactly a diet course. You have to choose the thing that makes sense to you. 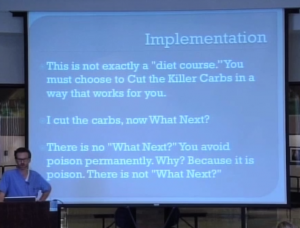 There’s a list of five or six ways to implement and we’ll talk about those and there’s no “What’s next.” After you cut the carbs, you cut them out of your life completely – you cut the killer carbs out of your life because they’re poison. To you, they’re poison. You don’t try and go back and say, “Now I can go back and start eating bread.” There’s no “What’s next,” this is a lifestyle change. And these are the implementation strategies: number one, cut the killer carbs completely and that’s what I recommend, the list of killer carbs – I recommend you just cut them out of your diet. Because for you, they’re not benefitting you. All they’re doing is harming you. Now if that doesn’t appeal to you, you can cut the carbs by 90%. This is kind of what I did when I started my diet was I said, “Look, I’m gonna eat a lot of vegetables and meat and just a little bit or carbohydrates” – a little bit of refined carbohydrates. But I found that when I ate a little bit of refined carbohydrates, two hours later I was hungry. So you can do this, cut the killer carbs by 90% and just have a little piece of bread. William Banting in his diet in 1869, he has a little piece of toast twice a day. But that’s about the limit of his refined carbohydrate consumption. So that diet will work but just beware, you can have cravings two hours later. There was a cardiologist in New York who claims to have treated 17,000 patients for overweight and obesity, and he did that by just saying, “You have to eat at least one-half pound of meat every single meal.” He said, “Cut down the starches, cut down the bread, but you have to eat meat.” Because if you eat that much meat and you’re not eating a lot of bread, then there’s not a lot of room left for you to put a bunch of carbs in there. But that will work. It’s a matter of “What do you think is gonna work for you?” Is what’s gonna work for you “cut the carbs completely”? Or is what’s gonna work for you eating a lot of beef? And you might say, “Oh, man, this is expensive, a half pound of beef at every meal.” A half-pound of beef would cost about $2.50, right? For three meals, that’s $7.50. It’s kind of expensive, but it’s not overwhelmingly expensive. Now what you can do is you can eat what’s on the list of things to eat and be sure you count the carbs. And this is basically the Atkins diet, this is from the Atkins book – that if you get to less than 20 net carbs a day, you lose weight rapidly. If you’re less than 60 carbs a day you still lose weight, for most people. And once you start getting up above 60, that’s when you start putting on weight. Now, the interesting thing is the American Diabetes Association Diet recommends you eat 180 grams of net carbs a day — that’s why your diabetes isn’t in control on the American Diabetes Association diet. 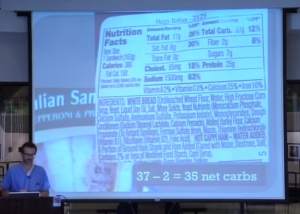 So some Americans eat 300, 400 grams of net carbs a day. And that’s the mystery of why we get bigger every year. We get bigger every year because carbohydrates make us bigger. ‘Cause if you get somewhere above 60, for most people, you’re gonna start putting on weight. And it differs from men and women – premenopausal, postmenopausal. So you have to kind of find out for you. The way the Atkins diet works is you start at less than 20 grams of carbohydrates per day and after a couple of weeks, you slowly start adding back carbohydrates until you find how many carbohydrates you can eat and still lose weight. And if you want to read his book, read his book. There’s Atkins Diabetes Revolution if you have diabetes, there’s Atkins’ New Diet Revolution if you just want to talk about diet. 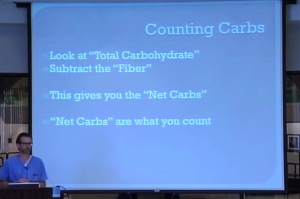 Let’s talk about counting carbs because if you’re gonna count carbs, well, two things: number one, there are some foods where you just have to look at the carbs because you have no clue how many it has in it. And number two, if you’re gonna count carbs, let’s say you wanna keep below 60 or keep below 20 you need to know how to do that. The net carbs are what you count. And the problem is, net carbs aren’t printed on the package. And it’s just like what that lady asked about the fiber. To find the net carbs, you find the total carbohydrates here, which is 37 grams, you subtract out the fiber – so 37-2 is 35. So there are 35 net carbs in this sandwich. And I included one of these in your handout. That’s why you gotta cut the bread if you want to lose the weight. If you want to control your diabetes, you want to control your blood pressure – this is just a sandwich, one sandwich. One sandwich is 35 net carbs. You have 3 sandwiches a day or 3 servings of bread a day, then you’re getting way up there, you’re getting to 120 grams of net carbs and that’s weight gaining. 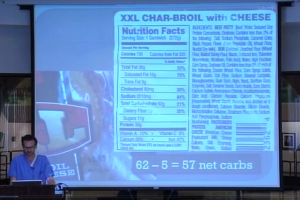 This is from the convenient store, the XXL Char-Broil with Cheese. So the total carbohydrate is 62 grams. That’s why hamburger buns are bad for you, by the way. They’re kind of big and thick and it’s got a lot of carbs in it. So 62-5 gives you 57 net carbs. So if you’re trying to stay below 60 a day to lose weight, control your blood pressure, control your diabetes, one hamburger and you’re done – you’re more than done. And the other thing is if you had a hamburger patty at home, what would it have in it? It would have some stuff; it would have stuff. Would it have stuff like beef, water, textured soy protein concentrate, is that what you add? Do you add high fructose corn syrup and soybean oil and etc.? That’s why you avoid processed food because what they do, hamburger meat is kind of expensive. So how do you serve somebody something called a hamburger but they don’t have to pay as much for it so they can make more profit off of you? You do it by adding textured soy protein concentrate, and some high fructose corn syrup to make it taste good. I don’t know if your hamburger at home would have microcrystalline cellulose, silicon dioxide, dicalcium phosphate and sodium acid pyrophosphate. Hopefully it would just contain something like beef.